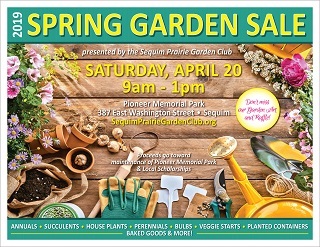 The purpose of Sequim Prairie Garden Club is to stimulate the knowledge and love of gardening. Members welcome the public to our monthly presentations on plants, landscape design and general gardening as well as various other topics of interest. Come join us. Members are a hard working group who like to have fun. Our headquarters is located at Pioneer Memorial Park, 387 E. Washington Street, Sequim, WA. Our primary purpose is to maintain, enhance and preserve the park and its many historical artifacts. The care of Pioneer Memorial Park was entrusted to SPGC through a 99-year lease, first from the Sequim Cemetery Association and now the City of Sequim. Revenue from our various fundraisers goes to park or clubhouse maintenance. Meetings and educational presentations are on the first Monday of the month, except holidays, then the following Monday at 10:00 am.